As a quantitative researcher, I sometimes find it difficult to see how the output from complex equations can make a difference to people?s lives. The launch event for the Northern Health Science Alliance (NHSA) Health for Wealth report was a fantastic opportunity to see first-hand how statistical analysis can actually be used to influence policy and practice. There is a well-known productivity gap between the Northern Powerhouse and the rest of England of £4 per person per hour. There is also a high health gap between the Northern Powerhouse and the rest of England, with life expectancy 2 years lower in the North. 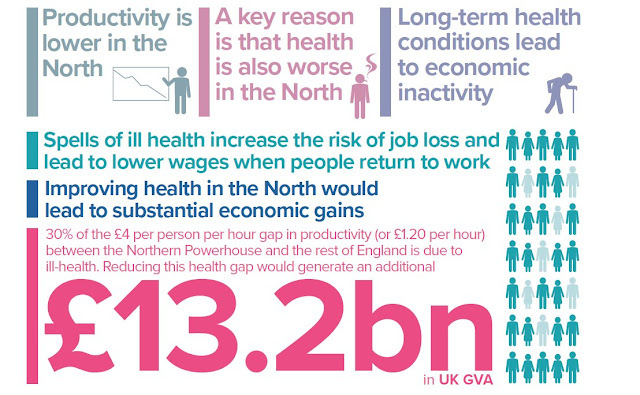 Given that both health and productivity are lower, the NHSA commissioned the Health for Wealth report to understand the impact of poor health on productivity and to explore the opportunities for improving UK productivity by unlocking regional growth through health improvement.